MISRATA, Libya - Muammar Qaddafi, Libya's all-powerful leader for four decades, spent his final weeks shuttling from hideout to hideout in his hometown of Sirte, alternating between rage and melancholy as his regime crumbled around him, said a Qaddafi confidant now in custody. Qaddafi, his son Muatassim and an entourage of two dozen die-hard loyalists were largely cut off from the world while on the run, living in abandoned homes without TV, phones or electricity, said Mansour Dao, a member of the Qaddafi clan and chief bodyguard. Qaddafi would spend his time reading, jotting down notes or brewing tea on a coal stove, Dao said late Monday in a conference room of the revolutionary forces' headquarters in the port city of Misrata, his temporary jail cell. 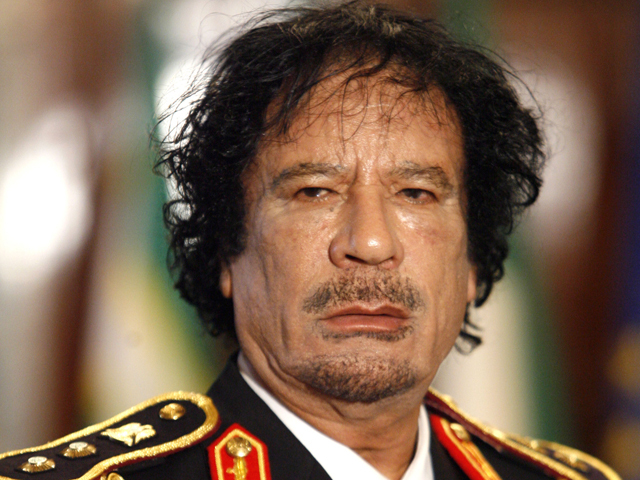 "He was not leading the battle," Dao said of Qaddafi. "His sons did that. He did not plan anything or think about any plan." The uprising against Qaddafi erupted in February and quickly escalated into a civil war that formally ended Sunday, with a declaration of liberation by Libya's new leaders. Qaddafi's capture and death Thursday, along with the fall of Sirte, the last regime stronghold, paved the way for that milestone. On the day of Qaddafi's capture, a convoy carrying loyalists, including the former Libyan leader and Dao riding together in an olive green Toyota Landcruiser, had sped out of Sirte to try to escape. But the convoy was hit by a NATO airstrike. Qaddafi and Dao were wounded and captured, and Qaddafi died in unclear circumstances later that day. Libya's interim government agreed under mounting international pressure to open an investigation. Libyan officials claim Qaddafi was killed in crossfire between revolutionary fighters and loyalists. However, video footage has emerged showing Qaddafi being beaten, taunted and abused by his captors. Peter Bouckaert of Human Rights Watch said Monday that there are strong indications that Qaddafi and Muatassim were killed in custody. He said a Libyan woman in the convoy told the rights group that Qaddafi was only lightly hurt in the NATO strike. Dao said he fell unconscious from his injuries before Qaddafi's capture and does not know what happened to his boss. The bodies of Qaddafi, Muatassim and Abu Bakr Younis, Qaddafi's defense minister, were put on public display in a commercial produce freezer in the port city of Misrata for four days, before being buried at dawn Tuesday in unmarked graves. A Misrata official said they were given an Islamic burial, with some relatives in attendance. Dao said Qaddafi fled his residential compound in Tripoli around Aug. 18 or 19, just before revolutionary forces swept into the city. After the capital's fall, Dao said Qaddafi headed directly to Sirte, accompanied by Muatassim. Qaddafi's former heir apparent, Seif al-Islam, sought refuge in Bani Walid, another loyalist stronghold, Dao said. Dao joined Qaddafi in Sirte a week later, while Libya's former intelligence chief, Abdullah al-Senoussi, shuttled between Sirte and the southern city of Sabha, the third remaining pro-Qaddafi bastion at the time. Al-Senoussi and Seif al-Islam, wanted by the International Criminal Court on war crimes charges, remain at large. Qaddafi's aides repeatedly urged him to step aside and leave the country, but he refused, saying he wanted to die in the land of his ancestors, according to Dao. "I feel sorry for him because he underestimated the situation," Dao said. "He could have left and gotten out of the country and lived a happy life." Dao had worked for Qaddafi since 1980, including as chief of his personal security in the 1990s. Later, Dao assumed command of the so-called Peoples' Guards, whose main aim was to go after Qaddafi's opponents. In Sirte, Qaddafi and his entourage switched hideouts about every four days, as the city was pounded by NATO airstrikes and revolutionary forces advanced. The group stayed within the confines of the so-called No. 2 neighborhood, seeking shelter in homes residents had abandoned as they fled the fighting. "We were scared of the airstrikes and shelling," Dao said, adding that he did not believe Qaddafi was afraid. He said food was scarce in Sirte in the final days. Dao has previously said that audio messages Qaddafi sent from hiding were transmitted by Thuraya satellite phone. In Sirte, loyalist fighters were led by Muatassim, who initially commanded about 350 men, Dao said. Many fled and toward the end, the fighting force diminished to about 150, said Dao, dressed in navy blue pajamas. Qaddafi, who once ruled a country of 6 million with an iron fist, railed against the loss of power. "He was stressed, he was really angry, he was mad sometimes," Dao said. "Mostly, he was just sad and angry."